D.VIEW/COLUMN: Use this button to cycle through the 3 available views on the LCD Display ('Performance View 1', 'Performance View 2' and 'Library View'). Hold down SHIFT and press this button to toggle the third column on 'Library View' of the LCD display between Length, BPM, and Key information. RANGE/KEYLOCK: Press this button to select the next available range of the Pitch Fader ( from ±6%, ±8%, ±10%, ±12%, ±20%, ±25%, ±33%, ±50% to ±100%). Hold down SHIFT and press this button to "lock" the track's pitch to its original key. The track's tempo will remain at the speed designated by the Pitch Fader. DECK. Swap Left decks (1 and 3) and Right Decks (2 and 4). The left side of the NVII will control VirtualDJ decks 1 or 3, and the right side will control VirtualDJ decks 2 or 4. S.VIEW/+KEY: Use this button to cycle through the available views of the Sideview (Automix, Karaoke, Sampler, Sidelist and Cloned Folders). Hold down SHIFT and press this button to sort VirtualDj browser by track's "Key" information. By default the sort order is ascending. If you wish to sort in a descending order, hold SHIFT button and press this button once again. Hold down SHIFT and press this button to sort VirtualDj browser by track's "BPM" information. By default the sort order is ascending. If you wish to sort in a descending order, hold SHIFT button and press this button once again. QUANT/+BPM (right side): Toggles a global "Quantize" mode. When quantize mode is enabled setting cues and loops will snap on the CBG, starting a song will snap on master deck's CBG and jumping between hotcues will take the CBG into account so that all jumps are beat-aware. L.PREP/PREP. Press this button to add the selected track from the Browser to the Automix List of Sideview. Hold down SHIFT and press this button to open/close the Automix List. FWD/+ALBUM: Switch browser focus the next window area (Folders, Songs, Sidelist). Hold down SHIFT and press this button to sort VirtualDj browser by track's "Album" information. By default the sort order is ascending. If you wish to sort in a descending order, hold SHIFT button and press this button once again. SEL./LOAD KNOB. Scrolls through Folders or Files. Push the encoder to load the selected track from the Browser to the left or right assigned deck. Hold the encoder down for more than one second to unload the deck. Note that as soon as the encoder is used, the Browser view of the LCD will be displayed automatically. BACK/+ARTIST: Switch browser focus the previous window area (Folders, Songs, Sidelist). Hold down SHIFT and press this button to sort VirtualDj browser by track's "Artist" information. By default the sort order is ascending. If you wish to sort in a descending order, hold SHIFT button and press this button once again. Hold down SHIFT and press this button to sort VirtualDj browser by track's "Title" information. By default the sort order is ascending. If you wish to sort in a descending order, hold SHIFT button and press this button once again. NVII's full-color displays provide real-time feedback of the software with different views of each deck. The three available views are 'Performance View 1', 'Performance View 2' and 'Library View'. To move to the next view, press the D.VIEW button (44). Turning the SEL. knob (46) will automatically turn on the Browser View. After 3 seconds without any operation, Browser View turns off automatically and the display returns on the previously selected Performance View. Pressing the SEL. knob (46) down to load the selected track on the assigned deck also turns off the Browser View immediately and returns to previously selected Performance View. 1Deck: Indicates the number of the currently left/right selected deck of VirtualDJ controlled by the left/right side of the NVII. Press the DECK (46) button to switch between the decks. 3Artist Name: Displays the Artist of the currently loaded track. 4Track BPM: Displays the original tempo (in beats per minute aka BPM) of the currently loaded track. 8Pitch Value: This is the current setting of the Pitch Fader. To adjust this setting, move the deck's Pitch Fader. 9Pitch Range: Displays the currently selected range of the Pitch Fader. Press the RANGE/KEYLOCK (45) button to adjust the range. 10Loop Pads: The length of each of the 8 Pads in Loop or Roll mode is displayed (depending on the selected Loop Bank). Buttons become blue when the corresponding loop is triggered. 11Track Progress bar: This is the currently loaded track's waveform, which is color-coded according to the frequency of each area: red indicates low (bass) frequencies, green indicated mid-range frequencies, and blue indicates high (treble) frequencies. 13Waveform: This is the currently playing segment of the track's waveform, which will scroll by as the audio play-head moves through the track. The waveform is color-coded according to the frequency of each area: red indicates low (bass) frequencies, green indicated mid-range frequencies, and blue indicates high (treble) frequencies. In the waveform, hot cue points are represented by triangles at the top and bottom of the waveform, and loop regions are represented by shaded-blue sections. 14Auto-Loop: Displays the deck's currently selected auto-loop length (or the length of the triggered Loop Roll). Button becomes blue when a loop or a loop roll is triggered. VirtualDJ provides the ability to adjust various display options, via a special NVII Settings Pads page. 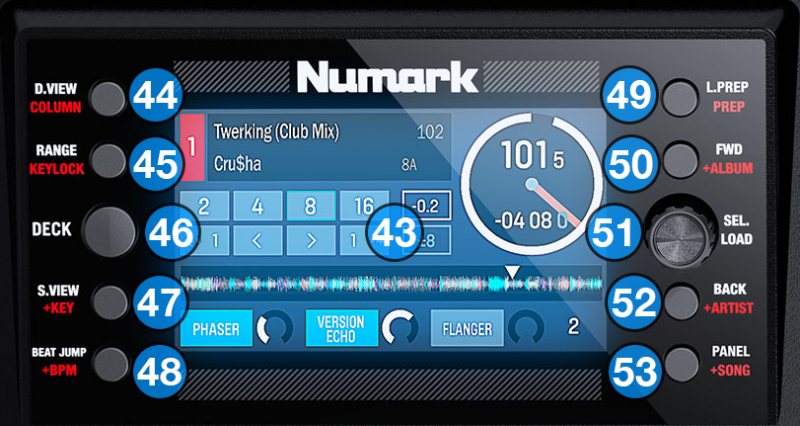 While the unit is connected, select the NVII Settings Pad page from any of the 4 available decks using the default VirtualDJ GUI or any other custom skin which has Pads integration. Alternativelly hold the "SLICER" pad mode button for more than 1 sec on any of the four available decks. Using the Pads from either the NVII or the GUI, you can choose to see Title, Title (Remix) or Artist for the 1st column, Artist, Genre, Album or Title for the 2nd column and Key, Harmonic Key or Key Difference on the 3rd column. Finally you can adjust the zoom of the scratch waveforms that appear on Performance View 2.